ROBYN IS PLAYING MORE SHOWS IN AMERICA THIS SUMMER!! 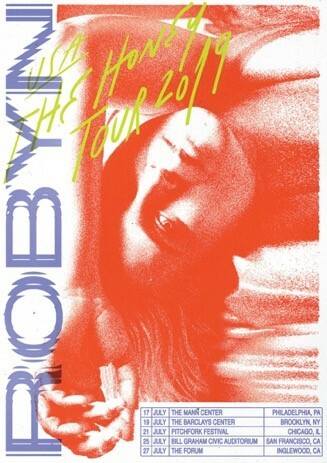 Following a sold out, rapturously-received North American tour this spring, Robyn has announced she will be returning to the U.S. for select shows this summer in support of her critically acclaimed new album Honey, out now on Konichiwa/Interscope Records. She will make a stop at the “Fabulous” Forum on Saturday, July 27th. Additional dates are below. A number of pre-sales will be happening throughout the week — check Robyn’s socials for more info. Tickets will be on sale to the general public on Friday, April 12th at 10 am in all local time zones. ROBYN’S SPRING SHOWS WERE TRANSCENDENT AND THE PRESS AGREED…..